After the explosion that ended issue one, Faith feels guilty she couldn't have done more. She finds some solace in grateful survivors and a phone call from her friend @X, reminding her she doesn't have to it all alone. She has to balance her hero duties with her secret identity as content writer Summer for Zipline. It's a lot to take on in starting her new life in Los Angeles. It doesn't help that her editor assigns her to write a hit piece about her ex's reality show. If her editor only knew that she was Torque's ex-girlfriend as the hero Zephyr. One of the aspects of Faith's character I like is that she may affable and low-key at work but she's no pushover. When her editor interferes with her piece she confronts her immediately. Faith is no victim, no shrinking violet. She's confident and knows her worth. It's an admirable quality to have your hero also be aspirational. She doesn't have to pretend to be a clumsy reporter to better hide her alter ego. She's believable in just being a substantive person. In two issues Faith drifts into daydreams that sees herself under best case scenarios.They've been wonderfully illustrated by Marguerite Sauvage and really stand out from Francis Portela's equally stunning work. The lighthearted scenes represent a look into Faith's mind. She sees herself approaching Torque for help and him begging for forgiveness. Of course, things go completely the opposite way but it just goes to show her optimism and a stalwart belief in what she's doing is right. The mystery of Sam and the missing psiots still needs some more fleshing out but with the shocking cliffhanger the next issue should delve more into that. Francis Portela and Andrew Dalhouse artistically create a well-paced and beautifully laid out story. Portela's eye for direction and choreography give the book an energetic feel from one scene to the next. Things are never static as the perspectives change to keep the reader engaged with each panel. Dalhouse's colors are varied but expertly focused on the foreground especially when Faith is featured. You can't keep your eyes off of her as it should be. A lot has been made of Faith's appearance but it's a non-issue. 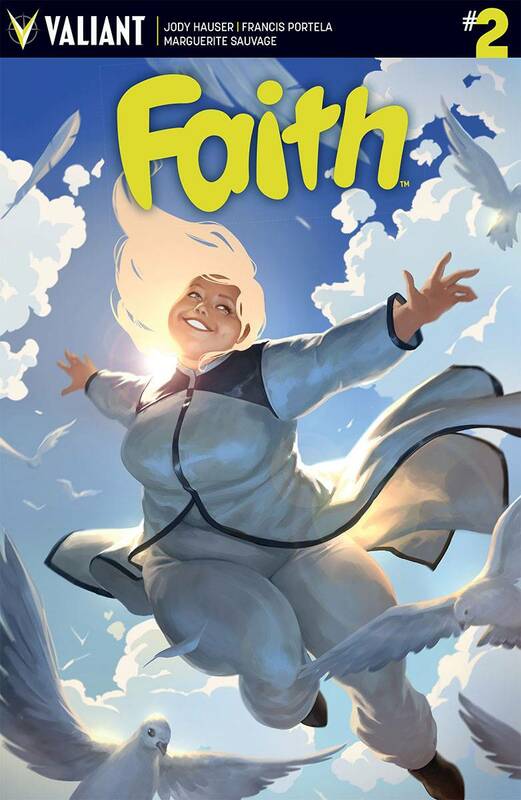 As a person, as a hero, Faith rises above the superhero fray because of her confidence and her humanity. Houser has taken the best aspects of superheroes, male or female, and installed them in Faith as a role model. Valiant has a flagship superhero book on its hand if it wants it. If this mini doesn't turn into an on-going title Valiant should pack up and close its doors. Needless to say but 'Faith' is a must buy.